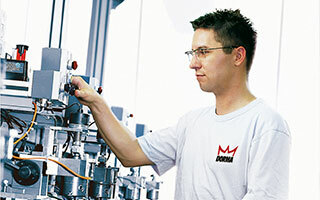 DORMA, of Ennepetal, Germany has produced innovative, high-quality equipment for doors since 1908, and believes in delivering “the best, at a good price”. The company evolved throughout the 20th century to become the dominant name in automatic door closers and now – through its business unit DORMA Time + Access GmbH – is a market-leading developer of automation solutions. Its product range includes custom components and systems for time recording, access control and data acquisition, targeting diverse applications from domestic and office markets to security equipment. Manufacturing is done in-house, and the company also builds boards for selected customers. Examples in production include the DORMA electronic closing cylinder for doors, an extremely small unit with embedded electronics based on a high-performance, low-power microcontroller. Boards for the closing cylinder are built alongside other complex assemblies including a customer board for an advanced weighing system, which has a 32-bit processor and four large BGAs. The high I/O densities of these boards challenge test coverage, and impose high pin counts for in-circuit test fixtures. This complicates fixture design, and also tends to increase lead-time. In addition, when large numbers of BGAs or similar devices are on board, implementing test points can become impossible for many of the signals. This is a common problem for test engineers, and can preclude achieving the required test coverage using fixtures or probes. To overcome the challenges surrounding test coverage and fixture design, DORMA engineers discussed the issue with the company’s test fixture manufacturer. The fixture designers suggested using boundary scan to test those parts of the circuit outside the reach of the fixture, and recommended XJTAG in particular. XJTAG combines readily with other test techniques, and includes many features that speed up the creation of tests and promote efficiency. These include automatic scan-chain detection, downloadable test scripts that are device-centric and reusable, and automatic connectivity testing. DORMA’s Hans Schmitz explains the thinking behind his team’s hybrid test solution, “Our in-circuit test partners have a good understanding of our products and technologies, and this is valuable for us. XJTAG has allowed us to increase test coverage for future generations of boards, while retaining our investment in these established relationships”. XJTAG has combined easily with our existing in-circuit test equipment and methodologies, and this has been critical in helping us achieve the test coverage we need for our latest generations of boards. Features of the system, including the lightweight and easy-to-use XJLink connector capable of adapting to many different types of boards, make XJTAG especially flexible and allow us to use boundary scan in whichever way suits us best. We have been able to meet our testability targets for some boards using XJTAG alone, which has simplified testing, accelerated product introduction, and delivered valuable cost savings. DORMA, a leader in security and access automation, is increasing testability for future generations of its assemblies by using XJTAG boundary scan as well as in-circuit test. This approach has enabled rapid progress, taking advantage of long-standing test-development partnerships while also gaining the extra reach and flexibility of boundary scan.